Όταν επέστρεψα, είπα την ιστορία με τον Νικολάι στην γυναίκα μου, για να μου πει "μα και εγώ αυτό ήθελα να δω όταν πρωτοήρθα Ελλάδα!". Gloria oliuæ! 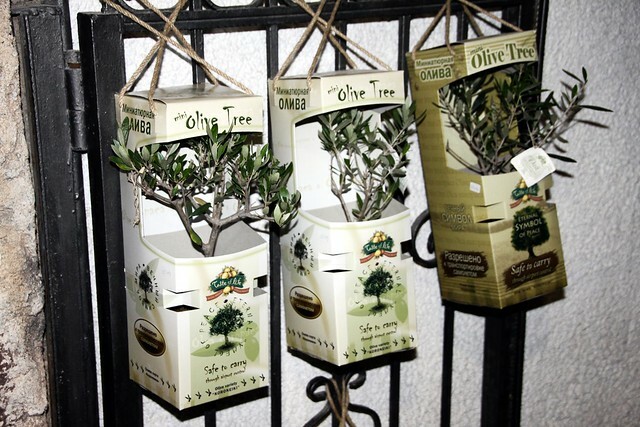 [ENG] When I saw these mini olive trees hanged outside a shop in Oia, I remembered a story: While I was working in Bulgaria, I had, one day, to go to Thessaloniki for a professional reason. My Bulgarian assistant and friend, Nikolai, asked me if he can come with me... He had never been in Greece before... Of course I said to him yes. When we passed the Greek borders, looking at a tree, he asked me "Is this an olive tree?". At that moment I realized that we did not see not even a single olive tree till we passed the borders, but, immediately after that, the olive trees were all around us... Greece is a blessed place... If only, we the Greeks, did not do everything to destroy it! When I returned back, I said to my wife about Nikolai's question, only to listen my wife saying: "but, I wanted to see exactly the same thing when I first came to Greece!". Gloria oliuæ! Do not worry, I do not think it would have survived in Poland! !